As a vegan, it is very easy to eat the rainbow -so to say. And this little creation is very much the rainbow. 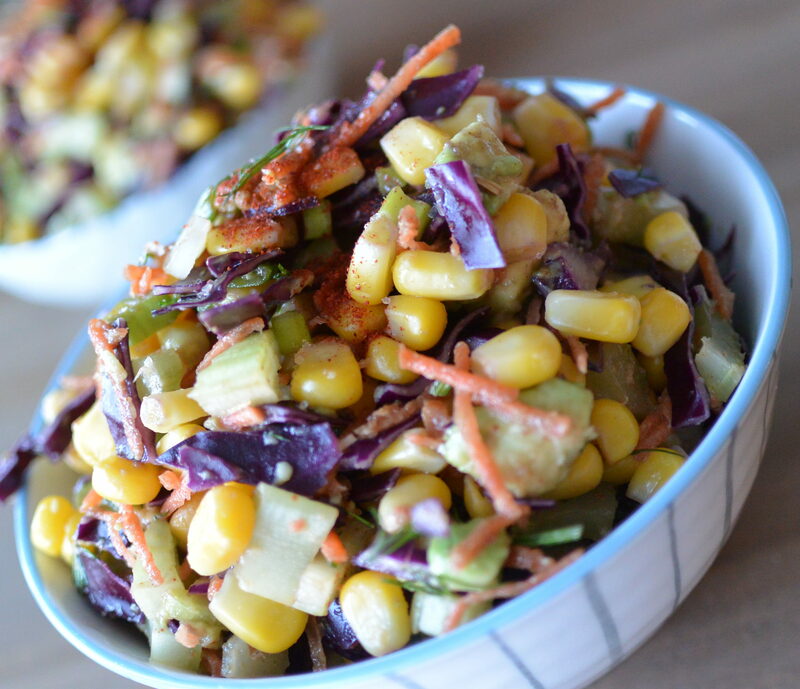 It’s a creamy rainbow slaw. I feel more than ever, maybe because its finally spring and the snow should be melting and tulips should start budding… (I say should because its still cold in Montreal and we still have so much snow on the ground) that my plate is filled with brightly coloured veggies and I’ve become obsessed with chipotle peppers… Have you noticed that most of my dinner recipes have chipotle peppers as an ingredient! So, my criteria this past little while has been, bright and colourful and SPICY! I wonder if this is my brain and stomach telling me I need a travel adventure? Maybe a trip somewhere warm? Bermuda? Actually, I’ve been to Bermuda and I loved it! I went with my parents and brother a few years before I got married. I have a funny little story about my father and I. It shows that we are both very head strong and fearless people! So, before Bermuda I have never scuba dived or snorkel before. And the beach we went to in Bermuda was called snorkel park… OBVIOUSLY, we had to snorkel RIGHT! But seeing as both my father and I are very stubborn and head strong we ignored the instructions and just decided to rent the snorkel mask and mouth piece… we thought it was stupid to rent the fins…. So, we begin our journey casually swimming along the beach and as time went on we went further and further in the coral… I have to sigh here and shake my head because looking back at our complete stupidity and lack of experience we both could have gotten hurt really bad. The first indication that we were way over our heads was that at one point I stood on a piece of coral. (THAT MY FRIEND THIS IS A NO GO!) second indication my father felt a burning sensation on his foot and leg (later we realised he cut himself on the coral) and the third indication was we were both so unexperienced that we weren’t able to actually appreciate the beauty that is the coral reef and the wonderful fish that live around it. When we got back to shore we both agreed that we should have been a lot more vigilant and we should have invested that extra 5$ for the fins… because my dad had a piece of coral lodges in his foot (not a huge piece but like a splinter size piece …that would only come out after 2 months (YES TWO MONTHS AFTER OUR VACATION the splinter was finally removed) Talk about a souvenir! Finally, what I took from this experience was to always be prepared, follow instructions and please respect nature. I also after this became bit by the snorkel bug because the beautiful wonders and sights that we explored took my breath away. Later on, my husband and I have gone on many snorkel and scuba dive adventures in French Polynesian, Bahamas the Dominican and even in Florida! So, although my first experience was not the best and it isn’t a story that I should be proud of but it is none the less a story with an important lesson. I have clearly rambled on about a passed story. The only reason I remember it was because I noticed my trend these past few weeks… Of wanting bright and colorful food with a little bit of a spicy punch. I hope this recipe will bring you back to a tropical vacation and bring out some found memories!! 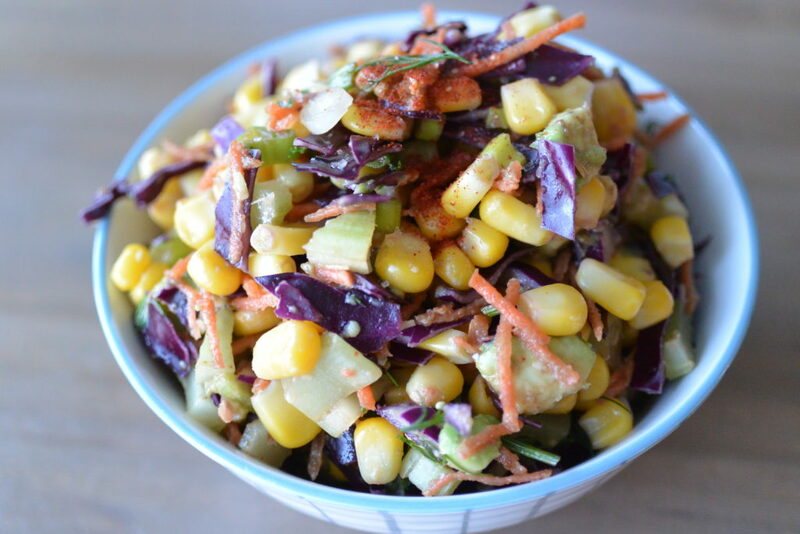 This creamy rainbow slaw is really easy to make. It requires very few added seasoning, I used fresh dill, chipotle powder pink Himalayan salt and apple cider vinegar. Because corn is not in season I used frozen corn. 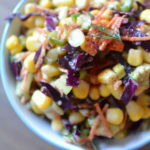 In the summer when corn will be sold fresh on cob, this recipe will be great with BBQ chard corn! Everything else I used fresh veggies! Basically, you will need to have cooked corn about a cup, 1-2 avocados diced small. About 1/3 cup of julien sliced red cabbage,1 -2 stakes of celery, chopped. 1-2 carrots grated or chopped and about 2 whole shallots (also stems chopped in) Mix in a bowl. Add in apple cider vinegar, fresh dill, salt and chipotle powder, and BOOM that’s it your done. ENJOY right away or store in fridge and eat later. 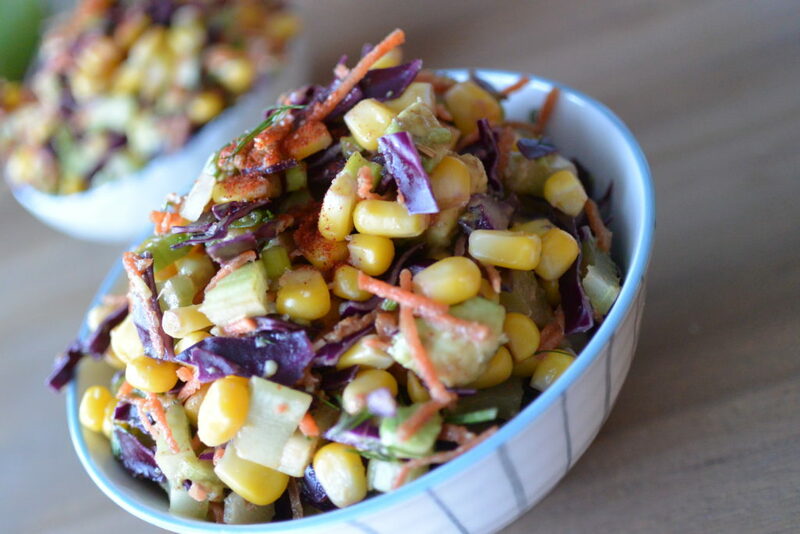 Either way you will have a deliciously easy rainbow slaw for you to enjoy. 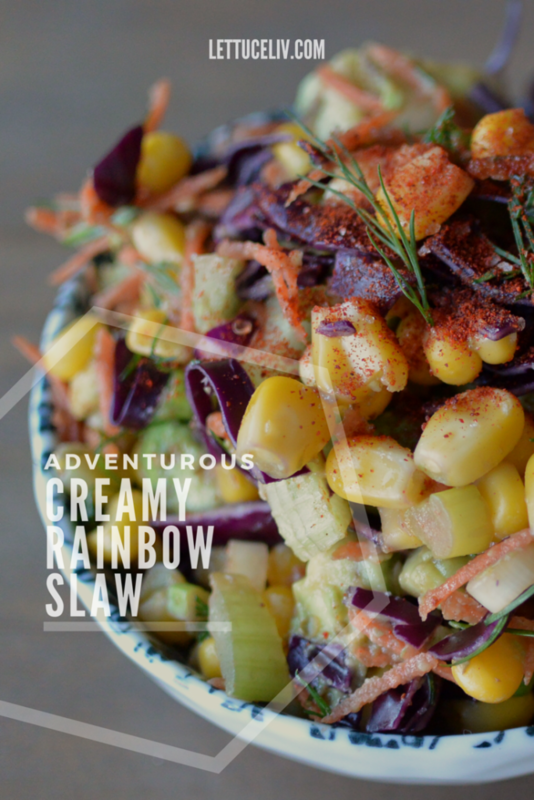 Please let me know if you enjoyed the creamy rainbow slaw recipe by sharing it on Facebook, twitter and Pinterest. If you have any feedback, I’d love for you to comment below. Have you done anything on vacation that in retrospect you would have avoided or done differently? This sounds great! I like that it’s different from your traditional slaw. I’m always down to trying new flavors! Oh my gosh, that’s incredible that your dad had a piece of coral lodged in him for 2 months!!! My husband seems to always get in scrapes when we go snorkelling. Twice he’s been stung by jelly fish and another time he stood on a sea urchin! Apparently it stung like crazy but he still declined the tour guide’s offer of peeing on his foot. ewwww! Your coleslaw looks so beautiful ❤️ I LOVE colourful food so this is definitely my kind of dish! This looks absolutely delicious!! I will totally be making this this summer!! As for the coral catastrophe – the one and only cruise I went on one of the people I went with sliced his leg open on coral and had to immediately have stitches on the ships hospital! So y’all aren’t the only ones! Ooh, chipotles, yes! I recently bought some online (can’t get them here), and they’ve featured heavily in a lot of meals recently. Fab, aren’t they? As is your slaw – I could quite happily tuck into that on its own. Forget anything else! I don’t think I have any holiday regrets, as such… oh wait…. one huge one regarding going away with someone as a last-ditch attempt to patch up our relationship. Needless to say, it was a bit of a disaster, which involved him yelling at waiter because he was convinced he was hitting on me! I was so embarrassed! Well, that’s quite a snorkeling story. And quite a beautiful slaw too. Looks yummy. It looks and sounds so delicious! I love all those flavours and textures and the name is fab! I fancy a big pile on a baked potato. This looks so refreshing and not to mention beautiful! All those colors…yum!! What a wonderful and tasty slaw its like arainbow on a plate. Simply delicious. This looks delicious! 🙂 I’m always looking for recipes like this to change my lunch options a bit. I’m with you on the chipotle, I seem to be adding it to everything at the moment, I’m sure it’s a bit addictive! Your slaw looks almost too beautiful to eat! I loved reading your story too, good to learn from our experiences! 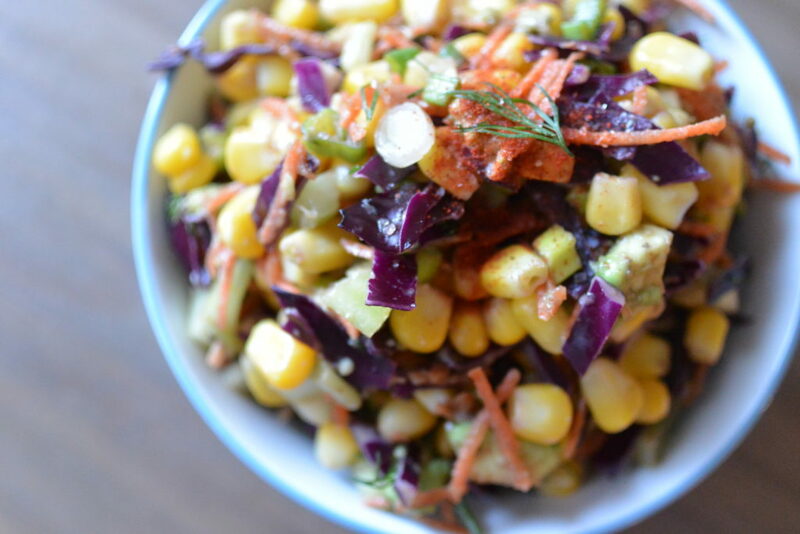 I love eating the rainbow too and this slaw recipe looks so colourful and deliciously. Perfect for a BBQ in the summer. The colors of this dish gives me hope that the summer is coming! This slaw looks and sounds so good!! Can’t wait to try it out. Thank you for sharing! There is something about a good slaw that makes me excited for the summer BBQs that are to come!!! I love that this one has corn in it, I am adding it to my list of summer must makes! Vegan or no vegan, this salad look very tasty. You created a nice color combination. This looks delicious! I admire you being a vegan, my husbands wants some type of meat at almost every meal so I don’t cook many recipes without meat but this will be a perfect side item! Thanks for sharing! A great story and to add a little colour to this recipe, which will go nicely with our fish tonight. This looks so yummy and colorful. Perfect for spring and summer. I can’t wait to try it. YUM! I want to eat this right now 🙂 Thanks for sharing!